As a UX Designer I was hired to lead the direction of design for the Array brand, as well as the design and front end development for the Array Cloud product. The goal of my position was to take a very complex product and improve upon the usability to create a satisfying user experience within an Agile environment. Array Technology is a document intelligence company that primarily serves the financial and real estate industries. 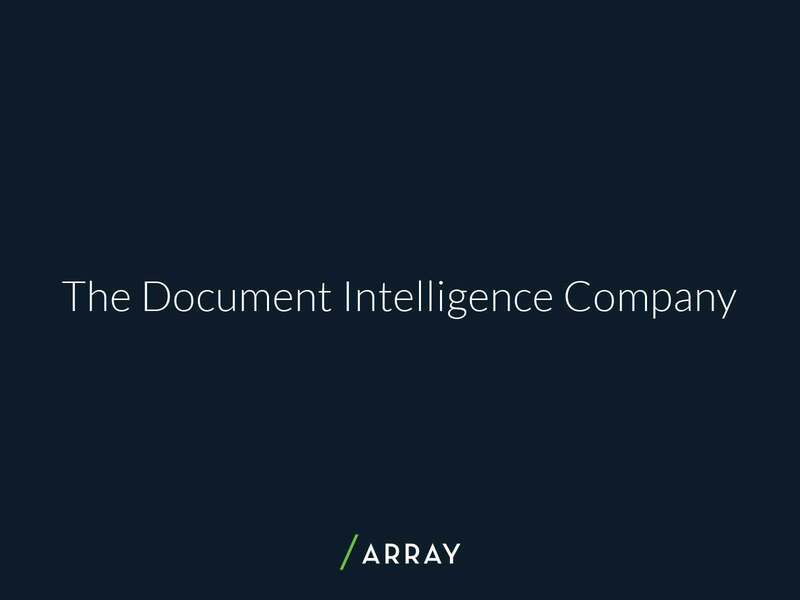 For such businesses that depend on reliable access to data, Array realized an ECM system in not always enough when you’re dealing with millions of documents daily. 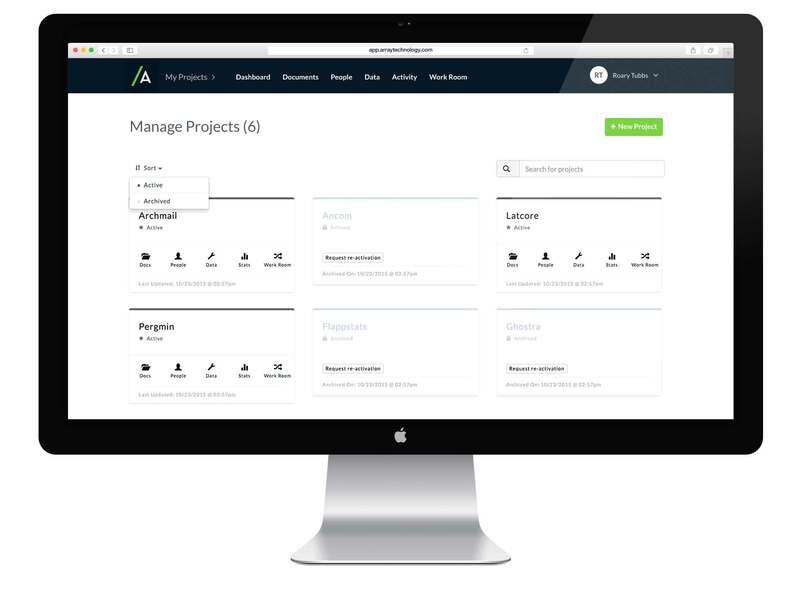 Array’s unique product automates the document management process with increased scale and quality of document imaging. Their product allows for reduced labor costs, more acute data mining, and improved functionality of ECM systems. This ultimately delivers better business intelligence and helps to minimize risk. Array already had an established brand, but it was limited when it came to the digital world. I introduced a secondary color palette that was used to distinguish product features, but would still remain a part of the primary color family. Intentionality is key, so color decisions should be lasting decisions. Once the secondary palette was implemented a more readable and reliable font face was introduced. Lato was chosen as the primary typography as the semi-rounded details offer a level of professionalism and fun. Part of any good UX is having a solid understanding of the user requirements and being their advocate. This starts with conducting user research and evaluating the feedback. Once I had gained this insight I was able to create a hierarchy of user interactions based on level of importance. Since the product is so complex this was a very important stage. This included subjecting early-stage designs to usability testing and offering implementation suggestions from a user-centered perspective. 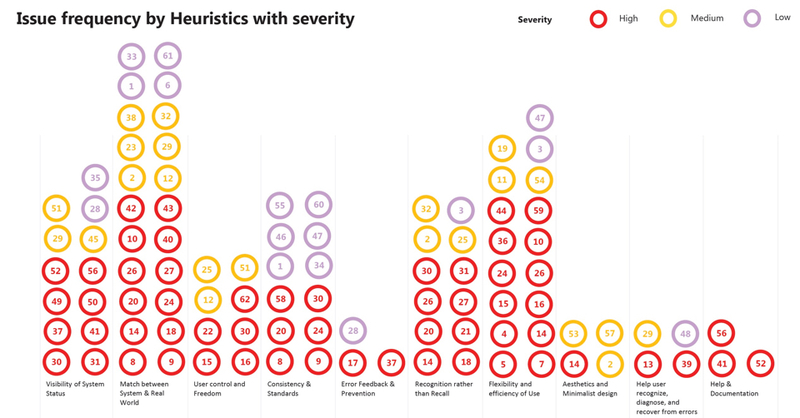 Part of being a UX Designer is also understanding that creating a positive user experience is never “complete”; it takes many iterations that are subjected to testing. So the cycle was just beginning. The existing product’s design could be overwhelming as it contained an abundance of user actions and tasks. To create a more focused and streamlined user experience I utilized the updated colors and typography from the brand refresh to help visually distinguish different user types, processes, elements and etc., along with dismantling the current choices into individual pages to help reduce the amount of decisions a user has at one time. This work was done while employed by Array, working in an interdisciplinary team that includes design, engineering, product, data science & research. Made with from OKC using WordPress, SASS & JQuery.